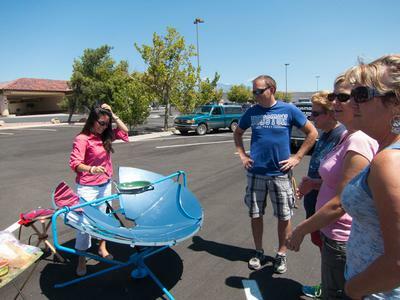 The Premier of the SolSource Parabolic Cooker in St. George, Utah took place on July 30th from 12:00-2:00 PM outside of the 1st Survival Gear Store at 867 S. Bluff Street. Pop-up canopies for shade and lots of sunshine in the parking lot made for an excellent two hour introduction of the technological and engineering wonder we were able to see and use personally. The Solsource Parabolic Cooker/Grill is the end result of much testing, design modifications, prototypes, and great production work. Even with a late arrival, the SolSource was up and cooking within about three minutes from the time it reached the event location, giving a good indication of how simple and easy it is to set up and take down the whole cooking unit. Right from first glance we could see the advantages of the well-designed features of the SolSource. We were impressed with it right from the start. Turnout for the event was quite good despite such short notice that we were given to notify people in our community of this impromptu demonstration. 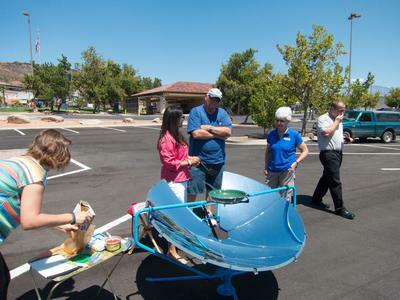 Besides the SolSource we also had several other solar cookers up and cooking before the start of the event in order to be able to have a variety of solar cooked goodies for sampling to the public. 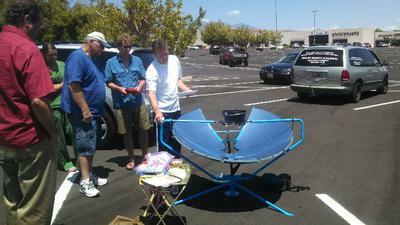 We had three two Global Sun Ovens and two All American Sun Ovens as well as a Solar Burner Parabolic cooker. In these cookers we had mini-ham and cheese sliders (rolls) as well as chocolate cake, spaghetti and spaghetti sauce and the Sol Source team provided quesadillas cooked on the SolSource. We had continual people passing through to see the new cooker and we still had plenty of time to learn about this newly introduced cooker as well as to hear the One Earth Designs team tell about some of their experiences with the SolSource while working in various villages in the Himalayas. Three members of their team were on hand for the demo, Scot Frank CEO and founder of One Earth Designs, Catlin Powers COO and Co-founder of One Earth Designs and Erica Young, the Chief Design Officer. All three were very good-natured, helpful and informative to our visitors and as well as to our own staff. All of us involved felt the event was very productive and it made all of us even more excited to be able to receive our first SolSource Cookers when they become available to the Public in October of this year. We are definitely anxious here at Solar Cooker at Cantinawest to offer the SolSource as a great addition to our extensive line of high quality solar cookers. Even better than the one we saw at demo. We have been informed that the final production units will be even better that the demo model, with lot's more enhancements and even easier to use and transport. Wow. Finally an easy to use parabolic. That's one good unit. Way to go.